When you walk into a cafe and note the numerous iPhone-toting denizens with telltale white earbuds firmly embedded in their ears, do you wonder what they’re listening to? If so, Frimby’s new music discovery and sharing app for iOS, SongStumblr, could help you find out. Recently updated to 2.0, SongStumblr uses your iPhone’s 3G and Bluetooth abilities to let you see what others are listening to around the world as well as around the block. You begin using SongStumblr by setting up a user profile with basic information about yourself and your location. When you play music either through SongStumblr’s built-in player, or with the regular iPhone player with SongStumblr running in the background, your selection is added to your user profile for others to see. When you feel like discovering new music, you can choose to do so with SongStumblr’s global mode, which gives you random music selections from users around the world, or local mode, which uses your device’s Bluetooth capabilities to share and receive song information from users within a 70 foot radius of you. In Global mode, SongStumblr displays a list of ten songs from random users around the globe. The list is refreshed every minute, and each listing includes the name and artist of a song, as well as the username of the person playing the song and a flag representing the country the user is from. Nearby mode works similarly, but instead of displaying songs from users around the world, you’ll see any songs that are being played by users running SongStumblr within range of your iPhone’s Bluetooth connectivity. Bluetooth sharing occurs automatically and doesn’t require pairing your iPhone with the other user’s. From within the app, you can listen to clips of discovered songs, find more information about the songs through Google, Wikipedia, Bing, or Twitter searches, or purchase the song in-app through iTunes. You can also save information about a song, including the date and location of where the song was being played, and the person’s username. 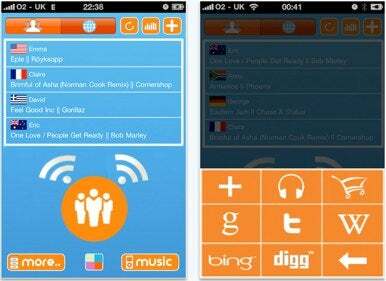 SongStumblr is a free app and runs on iOS 4.0 or later.